The University of New Brunswick’s Canadian Rivers Institute (CRI) received a boost in funding to support its work on the development of a new gene-based environmental monitoring method that is more cost-effective and accurate than other observation techniques. Keith Ashfield, Member of Parliament for Fredericton, on behalf of Leona Aglukkaq, Minister of the Environment, Minister of the Canadian Northern Economic Development Agency and Minister for the Arctic Council recently announced a $280,000 investment to support this research initiative. Michelle Gray, co-investigator of the project and director of training and program development of UNB’s CRI, says she’s excited about this project as it will enable CRI to further its core objective of merging research science with environmental and society needs. “We are working with the world's leading research team in this emerging field of using DNA sequencing for biomonitoring and assessment,” said Gray. “These methods will completely change the way we monitor the environment, providing high quality and accurate information, and will be cost-effective for even community and watershed groups to implement." 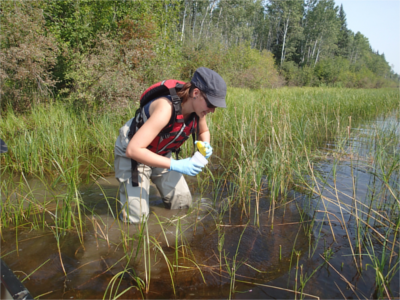 This new environmental monitoring method will follow the protocols of the Canadian Aquatic Biomonitoring Network (CABIN) and will focus on the water quality monitoring area of the Joint Oil Sands Monitoring Program. CABIN training and certification will then enable any agency with a mandate in watershed science—volunteers, First Nations, academics, consultants, industry, provincial/territorial departments—to collect consistent and credible ecosystem health data across Canada. “Our Government’s investments to support new innovations in environmental monitoring will provide researchers with more effective and accurate tools to ensure the long-term sustainability of priority ecosystems in Canada,” said Ashfield. UNB’s Canadian Rivers Institute is internationally recognized for advancing watershed sciences and ecological sustainability. The new method is a world first and was developed in collaboration with Environment Canada and the University of Guelph, supported by funds from Genome Canada.